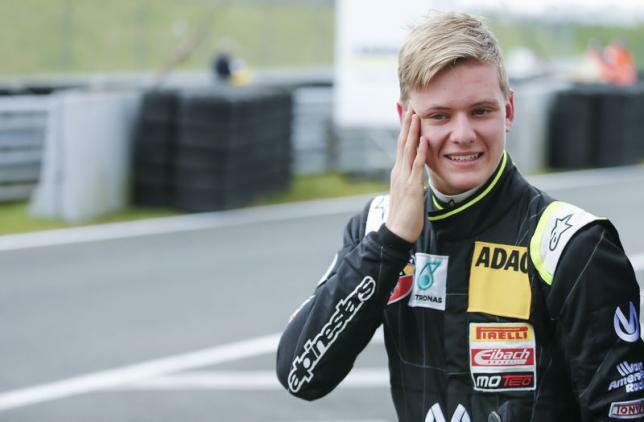 GERMANY – Michael Schumacher’s 16-year-old son Mick sprayed the winner’s champagne after capping an impressive debut weekend in German Formula Four with the first victory of his motor racing career on Sunday. Competing for the Dutch-based Van Amersfoort Racing team, the German lined up second on the grid for the last of three races at Oschersleben and made a quick getaway to lead from the start. Schumacher, who leads the rookie standings and is fifth overall in the championship, ended the 30-minute race behind the safety car with Australian team mate Joey Mawson second and fellow rookie Thomas Preining third. The teenager, whose seven-times Formula One world champion father suffered severe head injuries in a 2013 skiing accident in France, made his single-seater debut on Saturday with the world’s media in attendance. He finished ninth in that race, after starting 19th, and was awarded a trophy and podium appearance as the highest-placed rookie. “All in all I am pretty satisfied about how the race went. We had three safety car phases and (I had) pretty good restarts, so all in all I am quite happy about the race,” Schumacher said after that debut. The German finished 12th in the second race on Sunday, with the grid reversed for the finale so that he started second. The 2014 world junior karting runner-up was lucky not to be hit from behind at the start by British team mate Harrison Newey, teenage son of multiple title-winning Formula One designer Adrian Newey. Newey, whose father has a chequered history of racing cars despite his brilliance in designing them, was penalized with a drive-through penalty for jumping the start.